Shopping with my mom as a teen was a bit embarrassing, so I came up with a win-win solution. Shopping with my mother was always a bit embarrassing. Even when I was too young to drive myself to the mall, I felt silly to have mommy by my side. It was also weird because I knew what back-to-school clothes I wanted. I knew what winter coat matched my style. I knew how many school supplies I needed on top of last year’s leftovers. So my mom was pretty much just there to be the wallet. And the chauffeur. It felt weird for everyone when I would only beckon mom over when I was ready to check out. As with any awkward situation, I searched for a remedy. I found one. And not only did this fix the awkwardness, but it actually allowed me to get paid to shop. I asked to be given a budget whenever I needed to buy a large number of items. This was typically during back-to-school shopping. I asked to receive budgets for clothing and for school supplies. My parents would give me cash, and once it was gone, it was gone. Mom then didn’t need to take me shopping. She’s not much of a shopper, anyway. And we made it very apparent that any money I had left over, I could keep. This was excellent. It spurred me on to find amazing deals. I did most of my shopping online as a result. And this started in about 2003, so shopping online was super new. I also learned to take good care of my school supplies from the previous year so that I wouldn’t need to buy so many the next year. For my mom, this was great. Even when she still had to drive me and my siblings to the mall, she could shop for herself. She also enjoyed this method because she was able to give all of the children the same amount. For instance, a few weeks before school started, she’d give us each a certain amount of money, and then her job as the money handler was done. She could just enjoy going to the mall with us. Frankly, I wanted to do this because I was attracted to the chance of pocketing the leftover cash. Mom liked it perhaps because it was one chore off her hands. Whatever the reason, it taught me how to spend wisely. It was up to me how the money was spent, and if I messed up, I’d have to wear my unstylish, ill-fitting clothes from the previous year. That’s so not fetch (name that movie). This worked really well for big shopping runs. But know that it doesn’t work particularly well for small items – a black shirt for a school play, a new suit for a wedding, etc. For those events, it’s usually best to just have mom come along and pay. It’s easier, and you’re usually in a hurry, anyway. We used this budget shopping method for five years. We hit no snags, and I was able to pocket hundreds of dollars, which I then invested. That saved cash is now worth thousands of dollars. Who knew this little setup could earn someone thousands of dollars? I say go for this budgeting method. But if you don’t want to for whatever reason, I still encourage you to always look for a solution to an awkward situation. And if you’re anything like I was as a teenager, this will keep you busy. 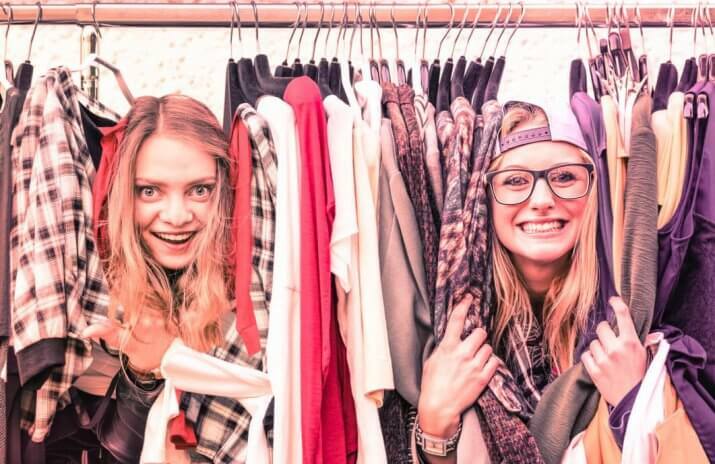 Teen Shopping Takes Mad Skills?